The new Arai Defiant Pro-Cruise Helmet is fresh off the press and information is forthcoming, however, the word on the street is that it will be hitting the stage for Fall 2014 and bringing with it an interesting change in the way that we see the helmet itself. First and foremost, the new line will come with a Pro Shade system already installed. The benefits of this are numerous for certain. The Pro Shade can be dropped with minimal involvement of your hands. All that is required is a subtle nod of the head and you instantly reduce the ambient light of the day and ease the strain on your eyes. However, the greatest advantage of the Pro Shade is that it does not require an alteration to the helmet itself to make room internally for the visor to be housed. 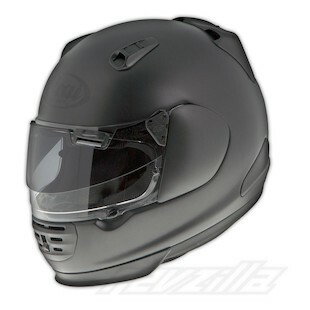 In turn, the system allows for helmets to retain a Snell safety rating. In addition to the inclusion of the Pro Shade system, the new Defiant Pro-Cruise will arrive with an exclusive Eco-Pure liner. This item allows for the interior to remain fresher, longer than the original option and will also become standard on these helmets just as the Pro Shade. Combine that with ear pockets that have been designed to better accept speakers and a Pin Lock lens that comes standard, and this quickly becomes a helmet with vastly increased functionality. Large improvements necessitate great strides. In looking at the new Arai Defiant Pro-Cruise Helmets that sentiment can be seen throughout. The inclusion of the Pro Shade system and similar advancements to the helmet henceforth is new to the game, yet not out of character for a helmet built on changing what is expected.